On October 15, 2012, Jackson County’s Rogue Valley International-Medford Airport broke ground on its first renewable energy project. Funded in part through Pacific Power’s Blue Sky Block program, the project will include the installation of a 15kW solar-electric system mounted to a 30’ x 60’ standing seam metal roof canopy covering the three toll booths servicing long and short-term parking. In addition, the project is eligible for an Energy Trust incentive. The project will be the first step for the Airport to capitalize on its solar resource and reduce power costs which directly affect the Airport’s operating costs. The pitch of the canopy, plus perfect (non-shaded) solar access, makes the installation an innovative demonstration project for the community. With over 600,000 passengers and visitors at the Airport each year, the installation will be seen by everyone accessing the front terminal area. The collaboration between the County, Pacific Power, and the Energy Trust is a win-win, helping to promote innovation and increase the visibility of renewable energy generation technologies through education and community outreach. The impact of the project will be the approximate equivalent of taking two average, Northwest households off the grid. RHT Energy Solutions, a local consulting company, conducted the site evaluation and helped guide the Airport through the grant process. The general contractor, also a locally owned and operated company, is True South Solar. It is anticipated construction will be complete and the system on-line in November 2012. A new 25-kilowatt array, intended to further reduce the facility's dependence on fossil fuels has been completed. The new array is mounted on three canopies that extend from the terminal curb out to the airport's flag plaza. The canopies are approximately 10 feet wide and total approximately 150 feet in length, with 3-by-5-foot solar panels attached. "It'll give people shade and protection from sun or rain as they get in from the parking lot to the terminal," said Bern Case, Airport Director. The project is being partially funded by a $170,684 Pacific Power/Blue Sky award. The Airport just completed its third Blue Sky project, the Net Zero Parking Project. 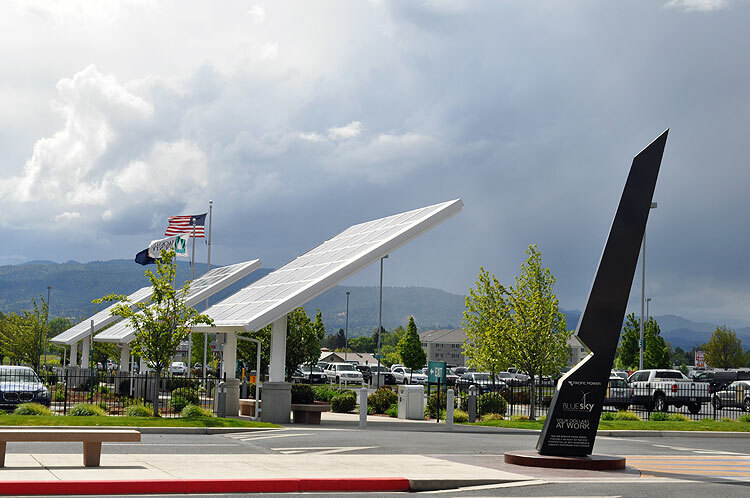 The project included an additional 25-kilowatt solar photovoltaic system mounted on three new canopies; adding an additional 11kW capacity to the existing canopy over the parking toll booth; replacement of 137 pole-mounted metal halide parking lot light fixtures with LED; and the installation of an electric car charging system. The Airport now has approximately 16 acres of parking with a net zero carbon footprint. The project is being partially funded by a $261,137 Pacific Power/Blue Sky award.